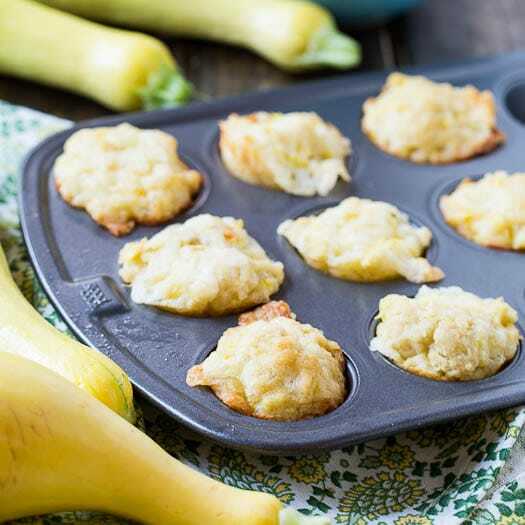 Mini Summer Squash Muffins are loaded with fresh grated yellow squash and Pepper Jack cheese. These savory muffins are great to serve with any summer meal. Their small size makes them easy to pick up and pop into your mouth. You won’t be able to eat just one. The squash flavor is barely discernible, possibly a negative for squash lovers, but definitely a plus for mothers trying to sneak more vegetables into their children’s diet. This is a recipe I ripped out of a Taste of the South Magazine years ago, 2008 to be exact and I enjoy making them every summer. I’ve changed the recipe slightly, using all yellow squash instead of a mixture of squash and zucchini and I’ve made them mini-sized. When you make the batter it will seem like there is too much squash and cheese in relation to the batter. But once baked, the consistency is just right. They are best served warm from the oven. Be sure to use Monterey Jack cheese with peppers, Pepper Jack. Without the added heat, these muffins would be on the bland side. Do you have a favorite way to use up your squash and zucchini? Savory bite-sized muffins loaded with grated yellow squash and Pepper Jack cheese. They are a little spicy and have a hint of sweetness. In a large bowl combine dry ingredients: flour, sugar, baking powder, baking soda, and salt. Add oil and eggs and whisk to combine. Add squash and stir to combine. Add cheese and stir. Spoon into prepared muffin pan filling just beneath the top. Sharing with The Weekend Potluck at The Country Cook. Be sure to visit! This entry was posted in Breads and Muffins and tagged muffins, yellow squash. Bookmark the permalink. I added an extra egg, because I didn’t think there was enough moisture. I put them in the oven, not expecting much….. they were delicious!! I hope my kids will like them too! So glad you enjoyed them Henriette! nothing beats a good home baked muffin.. definitely craving one of these squash muffins. love the savoury flavourings. wow, lovely squash muffins, yum. Grated yellow squash sounds so delicious with pepper jack cheese! Why should zucchini get all the fun? This is a great idea! 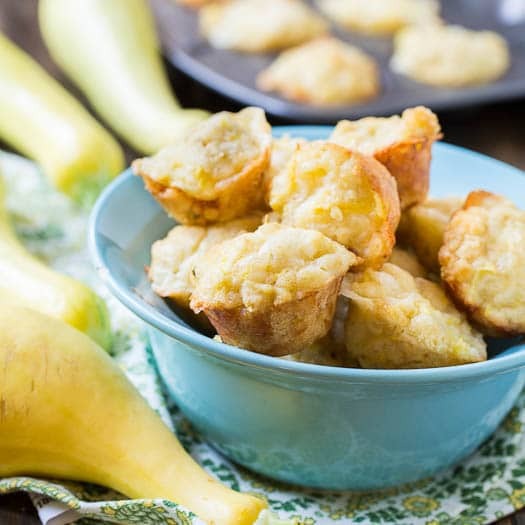 What a great idea for summer squash Christin! Really clever! Those look absolutely STUNNING! Yum! Thank you Alessandra! Love your name btw. Oh wow! I always use summer squash in my “zucchini” bread when I have too many squashes in the garden… but I never thought to make SAVORY muffins with them!! The pepperjack sounds awesome! Maybe a little cayenne to pep them up?? Some cayenne would be perfect Jess! 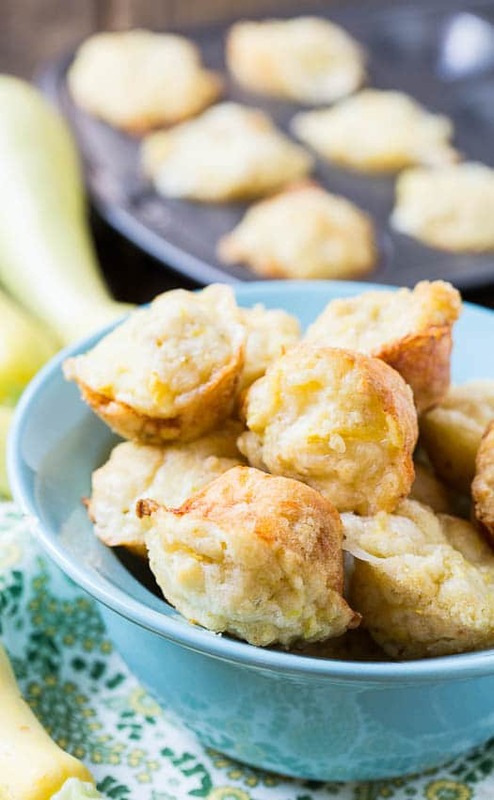 These would be a hit with my daughter – she loves the combo of squash and cheese! I adore squash! These muffins are smart and so perfect!! These muffins are adorable, Christin! What a great idea to use squash. And it sounds amazing with that cheese, too! They look delicious Christin, I have never had squash muffins! Oooh these look so yummy! I love savoury muffins. One thing we wish we could get in Aus is American Monterey Jack cheese – that would make these amazing! 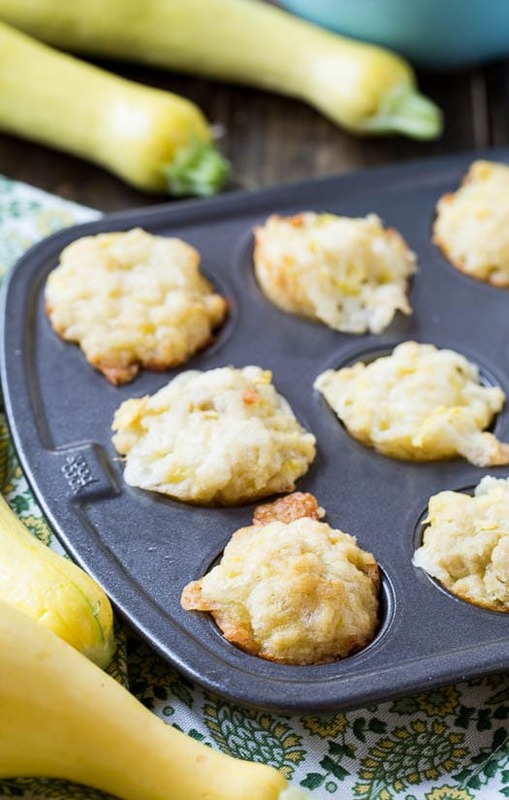 These muffins look great Christin, especially with the pepper Jack cheese…YUM! I used to hate summer squash but you just made it look so good! I could definitely eat it this way. Love the muffins!